Frogger has conquered the world! Frogger Returns (500pts – Konami) – A Japanese catch-up title that's been out for a few months in North America and just last month in Europe. We thought it was good fun and a nice return to form for a franchise that has spent a lot of time trying to become a platforming game. Romancing Saga 2 (800pts Super Famicom – Square-Enix) – Second in a Japanese series of generational role-playing games: every time your character (the king/emperor/queen/empress) dies you choose a new one to continue the line with the passage of multiple generations taking place before the game end. Galaxy Fight (900pts NEO GEO – SNK) – Sunsoft's debut entry in the 2D fighting game genre. Unlike most fighters the attack buttons don't map to punches and kicks necessarily; the sci-fi theme means there are non-human combatants that bite or use tails instead for a bit of freshness. 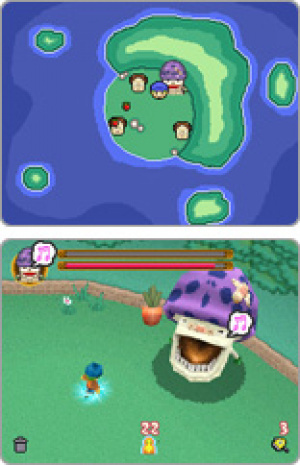 Feed the giant mushroom, some carrots or else! at Enter! Taisen Shogi 2 (200pts – Tasuke) – This appears to be the sequel to at Shogi Challenge Spirits released last October. As with the first game there's a Challenge/Mission mode seeing you play against a variety of characters with the big improvement being the addition of a Download Play option so you can play against a friend. at Enter! Taisen Mahjong 2 (200pts – Tasuke) – Another upgrade to a previous budget release from Tasuke, this one being an enhanced version of 200V Challenge Spirit Mahjong, which was released last September. As with Taisen Shogi 2, the addition made to this release is the ability to use Download Play against 1-3 of your friends to get a proper 4-way game of mahjong going. I hope we get the saga games in a future hanabi festival. Not a good week for Japan. I'm only interested in @ Simple Series Vol. 3: The Misshitsu Kara no Datsude ~ Prison Break. But I doubt we will see it here. 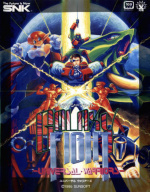 Galaxy Fight wasn't Sunsoft's first fighter. They were also responsible for the SNES port of World Heroes two years earlier. Their other Neo fighter, Waku Waku 7, is much better than Galaxy Fight though. Every now and then, it's nice to remember the things that don't make us feel jealous of Japan. Wow! We actually got something before Japan?! Considering they were never officially translated (and as far as I can tell, they haven't been unofficially translated either), I'd say that's impossible. Galaxy Fights looks pretty cool, although I'm more interested in Sunsoft's other Neo Geo title, Waku Waku 7.
mariofanatic, it won't happen. Romancing SaGa 2 is text heavy (as are most RPGs), and it's confirmed by executives at Konami that Nintendo doesn't allow developers to translate import VC games.